Just found us and don’t know where to start? No problem… I’m here to help. You have landed at the right spot if you are looking to become a successful blogger, build a business online, and use the Internet to generate passive income. You have not only landed at the right spot, you have landed at the right time. In our current economy, political environment, and uncertain days ahead, there has never been a better time to begin your online business to supplement or replace your income. If you want to know more about me and why I have this blog, read this. 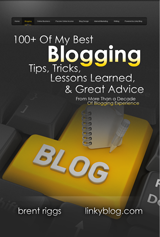 Next, get the Linky Blog EPIC Book, over 400 pages packed with information, experience, knowledge, tips, advice, lessons learned, and practical instruction. Not 400 pages of big fonts, wide margins, and huge graphics that eat up a lot space so a big page count can be advertised. The EPIC Book has over 135,000 words, dwarfing typical good eBooks that usually average 20,000 – 30,000 words. Nor it is just a bunch of filler content and stuff you won’t read so I can advertise a high word count. 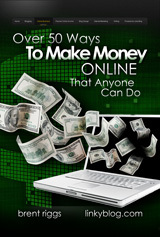 To get a serious jump start on your blog or your online business, check out the EPIC Book. Next, follow Linky Twitter. 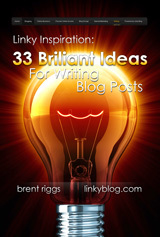 I post great tips, information, and advice on the Linky Twitter feed. 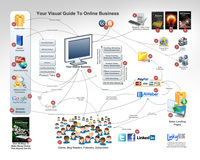 Then, read your free ebooks and visual guide. Additionally, here are some good posts to get you fired up and motivated. Finally, feel free to contact me personally with any questions, suggestions, or feedback. You are not an impersonal potential “client” to me. I’m a real person, so are you. If you are going to invest your time and loyalty in me, I’m going to be personally accessible to you. I try to answer every message personally. My email is brent@brentriggs.com or use the contact form. You can text me at 918-902-7691 (it’s harder to return phone calls; email or text is best but if you do leave me a voice mail, include all the details. I won’t return messages that simply say “call me” because they are usually sales calls).